The availability of embedded, digital systems has led to a multitude of interconnected sensors and actuators being distributed among smart objects and built environments. Programming and understanding the behaviors of such systems can be challenging given their inherent spatial nature. 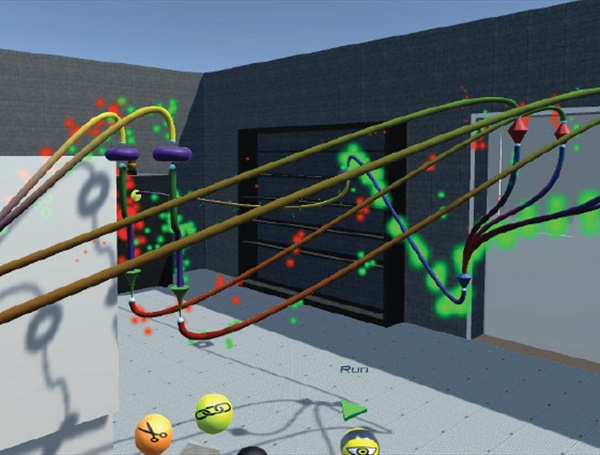 To explore how spatial and contextual information can facilitate the authoring of intelligent environments, we introduce Ivy, a spatially situated visual programming tool using immersive virtual reality. Ivy allows users to link smart objects, insert logic constructs, and visualize real-time data flows between real-world sensors and actuators. Initial feedback sessions show that participants of varying skill levels can successfully author and debug programs in example scenarios.